between master cylinder and slave cylinders at the wheels. from stone pecking where it is exposed under the chassis. automotive industry mass production economics dictated adoption of a low-cost form of double wrapped, furnace-brazed steel tubing that is still in use today worldwide. An inherently corrosion-resistant tubing material is the only way to insure continuing effective corrosion resistance. life-expectancy for automotive vehicles; 2)Worldwide service-experience data on brake tubing wear; and 3) Increasing cost of corrosion-retarding coatings for steel brake tubing. in number from 1 0 million in 1975 to 35 million in 1989. Automobile use habits serve as an unspoken directive to manufacturers to continue their efforts in providing cars with extended lives. The adoption of extended warrantees by the automotive industry compels design engineers to pursue the 10-yard-life goal as the new standard of total vehicle reliability. In the case of subsystems like brakes, a 20-year component life is desirable to ensure that critical subsystems long outlast the vehicle of which they are a part. trouble-free installation and safety/reliability characteristics. ISO 4038 (International Standards Organization) and SAE J1047. 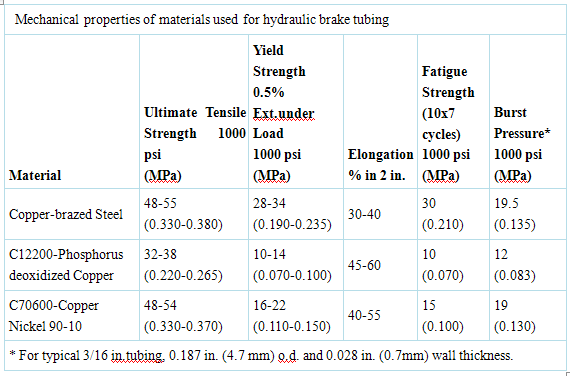 The mechanical properties of alloy C70600 in comparison with steel and copper are shown in the Table.